At the 2018 OAM Fall Conferences, the Association presented several special awards. OAM Administrator Mark Huberman was presented a Life Membership Award and Retired Magistrate Judy Fornof was presented the Annual Education Award. 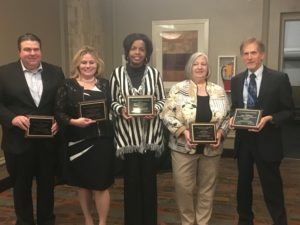 Receiving Judicial Awards were Judge Carla Baldwin of the Youngstown Municipal Court and Judges Ron Cable and Nicole Walker of the Akron Municipal Court.